You may or may not realize it, but you put a lot of your life on Facebook. The social networking website gets its hooks into everyone, making them lose their inhibitions about revealing everything in their lives, including all the latest snapshots. 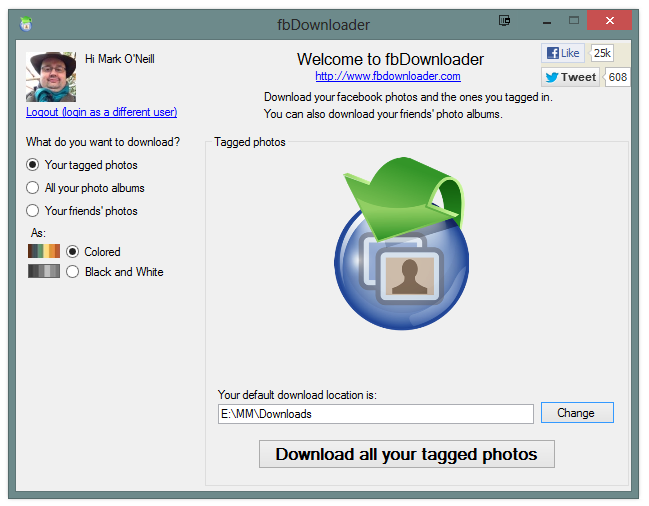 If this sounds like you, you may want to use fbDownloader to create a secondary backup of those pictures. "But Mark," I hear you ask, "why should I bother with a backup? Isn't the Facebook site secure enough to hold all of my crazy party pictures?" Well yes, but up to a point. Facebook accounts can be hacked. Even if you have the foresight to turn on "Login Approvals," which is Facebook's version of two-factor authentication, there are no guarantees. 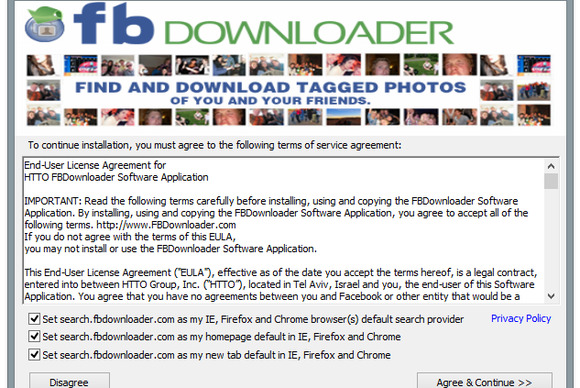 After starting fbDownloader, you will see your options on the main screen. 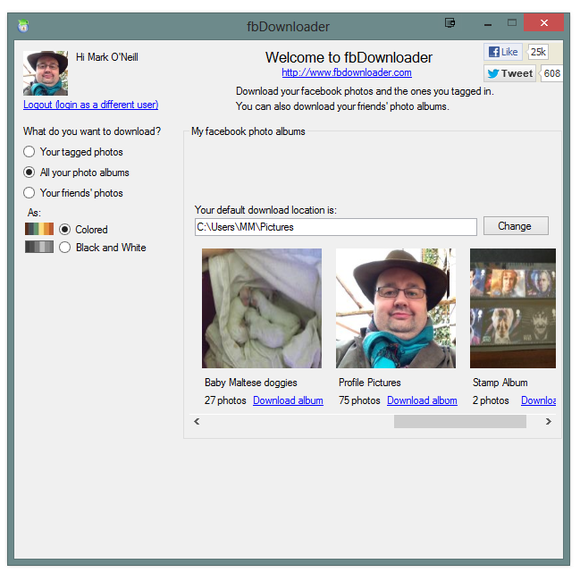 On the left, you can choose either your photos or your friend's public photos. Plus it isn't just hackers you should be concerned about. Facebook makes the rules, and if it doesn't like the way you interpret them, the company can shut your account down without warning (which they've been known to do). If that happens, then goodbye photos. It may not just be your party pics that get zapped. Precious and irreplaceable family photos would also disappear. It pays to have an insurance policy. If a hacker or Facebook ruins your day by cutting off your access to your Facebook account, and everything in it, then you will have a perfectly organized backup offsite. 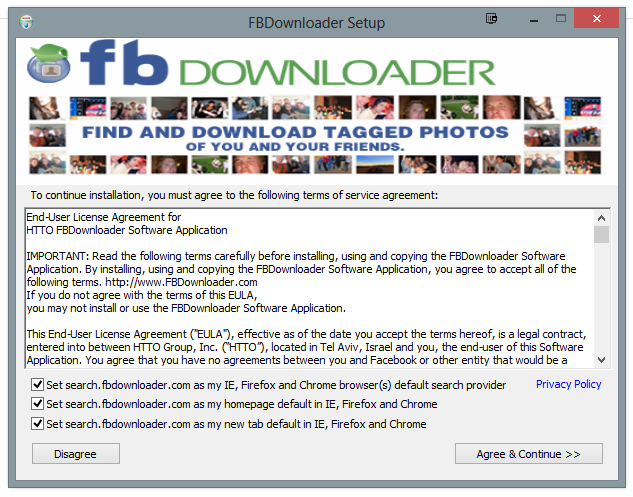 After downloading fbDownloader, install it the usual way (taking care uncheck the boxes for bloatware and browser settings changes). Once installed, it will ask you to log into your Facebook account (when you are finished, you can revoke its access) and then the main screen will come up. It will give you three options to choose from: download your own tagged photos, download your photo albums, and download your Facebook friends' public photo albums. Choose the option you want and the screen will change accordingly. If you choose the photo album option, you will see all of your albums in the app and you just have to click on the ones you want. You can also choose whether or not you want the photos in color or in black and white (although the black and white option requires first that you "recommend" them on Facebook). The first option, the tagged photos, is just a "click and wait for it all to download" deal. You can't pick and choose which pictures you want. It's either everything or nothing. But if you choose the second option, your photo albums, then you have a bit more flexibility. You can view each of your albums in a list and choose which albums you want downloaded to your computer (although you still can't choose individual pictures). The same applies to your friends' albums. You can choose the album, but you can't choose a specific picture. This isn't so much of a problem if the album in question only has a few photos inside it. But some albums have hundreds of photos and if you only want a few, you'd better limber up your Delete key finger. You'll want to uncheck all those boxes before clicking "Agree & Continue." One other issue I encountered was that once the downloading process has started, there is absolutely no way to make it stop, except shutting down the program completely. There's no "cancel" option, which is an unusual omission in this kind of program. These small nitpicks aside, this is a nice little program that allows you to backup your Facebook pictures easily, without too much hassle. If fbDownloader doesn't tickle your tastebuds, though, then PhotoGrabber is another solid choice (and a free and open-source one at that). There's no harm in trying both and seeing which one you prefer. The moral of the story is: Don't rely on just one site for data of any kind. Always have at least one backup elsewhere. For Facebook, these two apps will more than suffice. We put more of our lives on Facebook than we realize or like to admit. If you lose access, you lose data…so back it up.